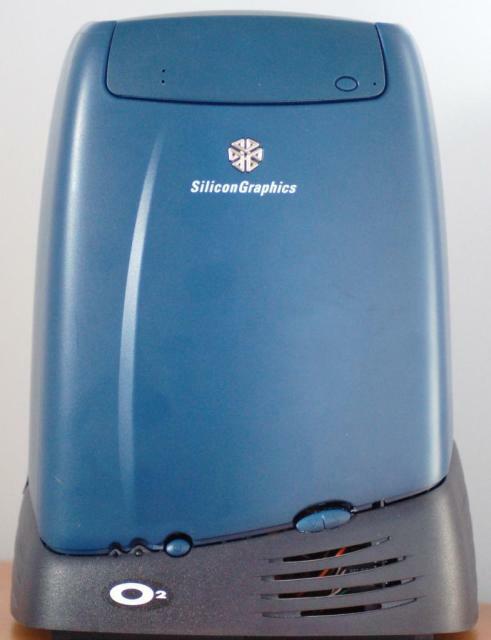 I’ve had an SGI O2 for a few years now, but it’s been sat on a shelf for most of that. Back in November I tried to install Vista on my old desktop machine and found it was… rubbish. 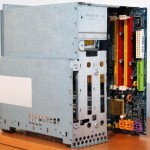 This inspired me to build a new PC using the case and chassis of the O2. After all, the O2 looks amazing; I don’t think many PC makers could make anything like it these days. Only after I started did I find that someone else had done pretty much the same thing. 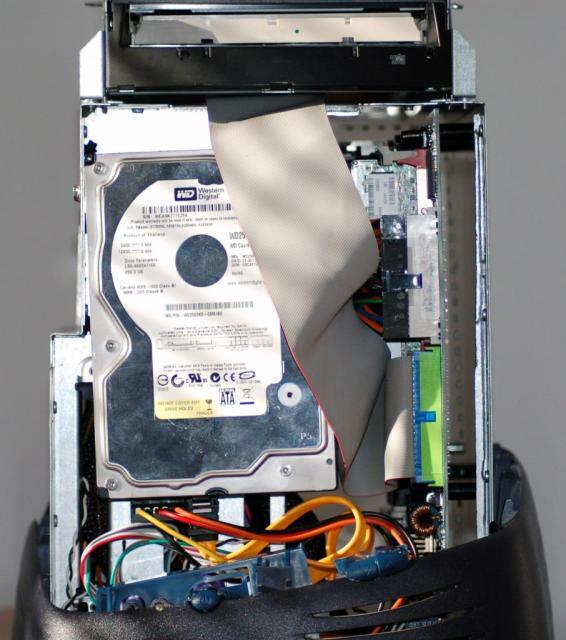 I wanted to keep most of the original components and I thought that it would be easier to mount the DVDROM drive on the top if I kept the original internal steel chassis. Looking at the other method (which used a carbon fibre replacement chassis) I think that gave a neater finish, but I’m still happy with my result. With the limited dimensions available, I settled on fitting a micro ATX motherboard and having read a review on Tom’s Hardware, bought a Gigabyte GA-956GM-S2 from Dabs. I’d hoped that despite the theoretical maximum dimensions being 244x244mm it would actually a little smaller. 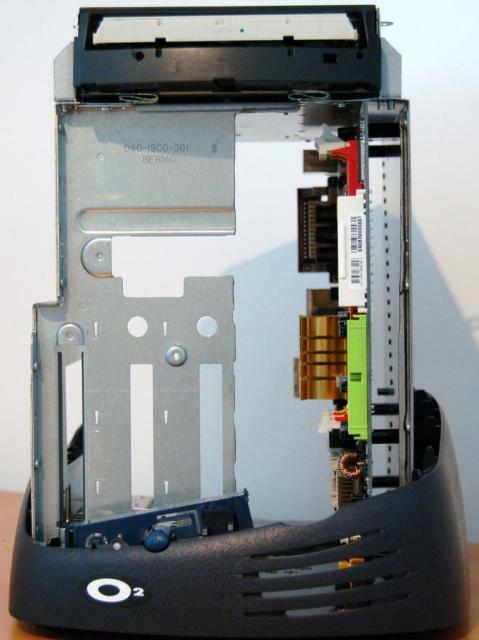 Unfortunately it wasn’t, and I had to cut a slot out of two of the sides of the chassis (front and bottom). The steel in it was so tough that I ended up using around 30 Dremel cutting disks to make the cuts. 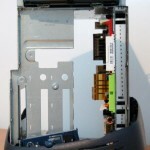 Once the slot was done, I could mount the motherboard using some 20mm plastic PCB spacers from Maplin. With this done, I then recycled the Lite-On DVD burner from my old PC into the mounting bay on top of the chassis. With a little work I managed to reuse the original SGI facia and tray plate with the Lite-On, so it completely hides the DVD (and the eject button works!). As I wasn’t going for huge performance, I fitted an Intel Core 2 Duo 6600 and 2GB DDRII RAM. I was happy to use the onboard video card (which I knew would run Vista Aero without problems). I used the stock Intel CPU cooler and fan. I wanted the machine to glow blue a little so I bought an Akasa 400W PaxPower PSU from Overclockers which I fitted on the base of the chassis. In hindsight I think I probably should have bought a more compact PSU with modular cabling as there’s so much unused wiring inside. 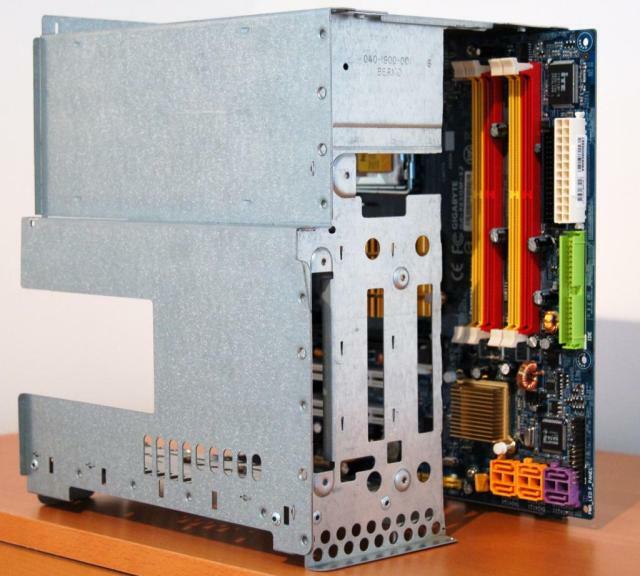 The 250GB WD WD2500KS SATAII hard drive is mounted verticaly by a couple of chassis screws and is also supported by some silicone rubber dampers to keep the vibration down. 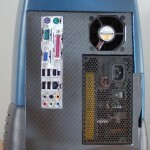 The chassis also has holes behind the hard drive to improve air ventilation. 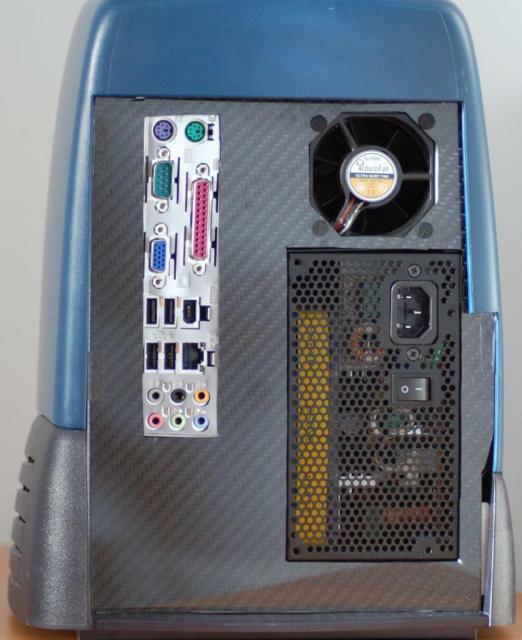 For the rear backplate, I bought a sheet of carbon fibre from RS and cut it to size, along with cut outs for the connector panel, PSU exhaust and the system fan exhaust. The two fans do a really good job at pulling cold air in through the “gills” at the bottom of case. 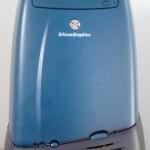 The system fan is a 60mm Acoustifan from QuietPC. With the QST option enabled in the BIOS I generally don’t hear any noise from it despite the fact it’s sat next to me on my desk.